We just learned about the Mexico State of Yucatán..
Another Mexico state is Querétaro. This state is in the south central part of Mexico, and has a lot of types of land like forests, deserts and rainforest. The coat of arms of Querétaro tells of a legend where there was a solar eclipse during a battle between the Spanish and the natives. During the eclipse the saint of Spain and a holy cross showed up. The bottom left shows the saint in battle, and the bottom right has wheat and grapes for the farming in the area. Just like other parts of Mexico, there are large pyramids in this state in the city of El Cerrito. Gustav Eiffel who made the Eiffel tower made a famous fountain in Zocalo. There is a large gorge in the Sierra Gorda called Sótano del Barro. We just learned about Rose of Lima and the Dominican Order. Another group of nuns are the Carmelite Nuns, that started in the about a thousand years ago. cow is αγελάδα (ageláda), chicken is κοτόπουλο (kotópoulo) and pig is χοίρο (choíro). Also in Greek horses say hinnire, sheep say baa, and ducks say pa-pa-pah. We just learned about the Volcano tectonic earthquakes. Another thing that causes earthquakes is induced seismicity, which means things that people do that cause earthquakes. This can be drilling into the ground, building large lakes or mining. Let's learn about some cephalopods!. One of the most famous ones is the Common Octopus. Some funny things about the octopus are that while a lot of people say "octopi" for a group of them, the right word is actually "octopuses". Also, people say that an octopus has tentacles, but they actually have arms. The difference is that arms have suction cups all along them, and tentacles only have suction cups at the end. There are about 300 different types of octopuses in the world! These cephalopods can change color to hide, and they use their arms to grab their prey and use their beak to crack open any shells for animals they have to eat. We just learned about the Carpal Ligaments that connect the forearm bones to the carpal wrist bones. Another group of ligaments are the Intercarpal Ligaments that connect the carpals to each other. There are eight different carpal bones in the wrist, so these ligaments connect them all together. We just learned about the Mexican state of Tabasco where the Spanish first landed in Mexico. Another state in Mexico is Yucatán. This state is on north end of the bottom tail of Mexico, right on the Gulf of Mexico and the Atlantic Ocean. Yucatán's coat of arms is green and yellow. It shows a deer for the native Mayan people, jumping over an agave plant which grows in the area. On the top and bottom are Mayan arches, and the left and right are Spanish towers, for the two different people that live there. There are ancient buildings in the city of Chichen Itza, like an ancient pyramid nicknamed "el castillo" which means "the castle"
In Cuzuma and some other cities are some caves on the water that people can go tour. Another big pyramid on Yucatán is the Pyramid of the Magician in the town of Uxmal, which is over 13 stories tall. The name of the pyramid comes from old legends that said a magician built it in one night. We just learned about the nun Clare of Assisi. Another famous nun was Rose of Lima, who was born in the country of Peru, and spent her whole life helping to take care of sick and poor people. She was a member of what is called the Dominican Order, which was a group started by a Spanish priest named Dominic around 1200 AD. 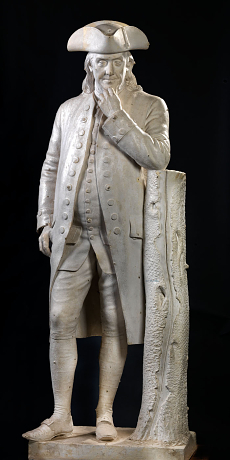 We just learned about the statue of Benjamin Franklin by Hiram Powers in the US in 1862. Another neoclassical sculpture is the Woman of Samaria, sculpted by William Henry Rinehart in Washington DC, in 1859. William Henry Rinehart was born in Maryland, and grew up as a farmer. When he was about 20 years old he got another job as a helper to a stone-cutter, where he studied sculpture. At 30, he moved to Italy to learn more about sculpture, and did some marble reliefs. He came back to the US a few years later and opened his own studio where he made a lot of marble and bronze sculptures for the US Capitol of Washington D.C. Eventually he moved back to Italy and lived the rest of his life in Rome. This famous sculpture of his is of the woman in the book of John in the Bible who came to the well to get water, and she met Jesus. He asks her to get him some water, and then tells her he can give her eternal life. We already know that in Greek, dog is σκύλος (skýlos) and cat is γάτα (gáta). Also in Greek cows say mou mou, chickens say ko ko ko, and pigs say greelizee! We just learned about the Earthquake Swarm, a lot of earthquakes happening in the same area. Scientists spend a lot of time trying to figure out what causes earthquakes. 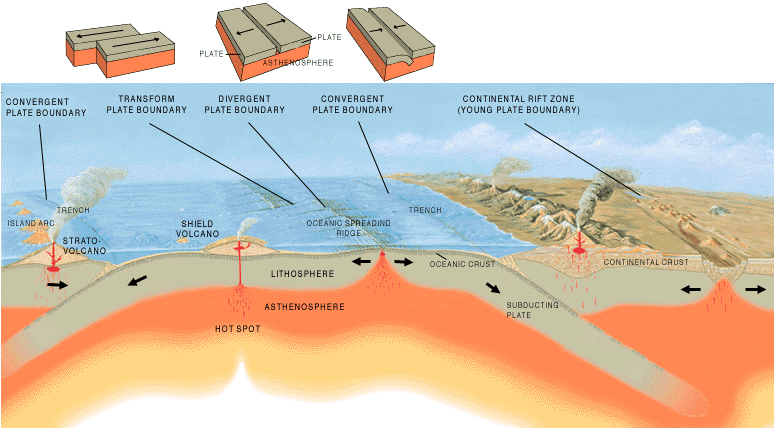 Another cause of earthquakes is from Volcanoes and tectonic plates. We learned a while back about the melted rock called magma that flows around like hot water under a volcano before it erupts. Sometimes that hot magma flowing around underground can put a lot of pressure on the rocks above it, and cause it to crack, causing an earthquake. You can think of it like water in a water balloon, when you squeeze the water balloon it will pop! We've learned a whole lot about frogs, now let's learn about Cephalopods! There are over 800 different kinds of cephalopods living in the world, and around 11,000 kinds of cephalopods that have gone extinct and are no longer around. Some cephalopods are really famous, like the octopus or squid, but some you may not have heard of like ammonoids or nautilus. The super science name for an animal is split up into these parts: Kingdom, Phylum, Class, and sometimes Subclass. Sometimes there are even more parts like Suborder, Infraorder, Family, Genus or Species. Scientists use these words to come up with special names for every single animal on the planet from mice to elephants. The "phylum: Mollusca" actually means that an animal like an octopus is sort of related to a snail! There are lots of different types of cephalopods, we'll learn about some fun ones next time! We just learned about the San Luis Potosí where they have many gold and silver mines. Another Mexico state is Tabasco. This state is on the south part of Mexico, right on the Gulf of Mexico which opens up to the Atlantic Ocean. The coat of arms of Tabasco has a picture of the Virgin Mary in the middle, for Catholic church. The top left has four castles, for the Spanish kingdom of Castile. The top right has a sword and shield for the power of the Spanish. The bottom left has a native holding flowers for the farms. There are many ancient pyramids in Tabasco, like the one in the city of Comalcalco. There is a special dance in Tabasco called "Zapateo" which means "toe tapping" and is a type of tap dancing. Tabasco was the place where the Spanish people first landed over 500 years ago, and met the Native people who lived there. We just learned about the nun Hildegard of Bingen who studied and wrote many letters and books. Another well known nun is Clare of Assisi, who lived in the 1200s AD. Her brother Francis was very well known in the church, so when she wanted to give her life to worship God, he helped her out. She started up a group called the "Order of Poor Ladies" and wrote up some rules for how women could live as Nuns and worship God. There are still women who follow these rules, and call themselves the "Poor Clares". We just learned about the statue of George Washington by Horatio Greenough. Another neoclassical sculpture is Benjamin Franklin by Hiram Powers in 1862 in the US. Hiram was born in the US, and after making some famous sculptures he moved to Florence Italy, so he could get marble for sculpting easier. and green, blue, purple, pink are πράσινο (prásino), μπλε (ble), μοβ (mov), ροζ (roz). Let's learn some more colors! We just learned about the Tsunami Earthquake that isn't very big but can trigger a tsunami. Another type of earthquake is an Earthquake Swarm. This is when a lot of earthquakes happen in the same area, and are clearly not just aftershocks or foreshocks from one single earthquake. These can be hundreds or even over a thousand earthquakes in one state, spreading out over a time of days, weeks or months. One of the ones that happened not long ago was in Nevada, with 1,000 earthquakes between February and November 2008. We just learned about frogs eating their skin, and breathing through it. When frogs eat, they don't chew up their food like other predators with big teeth. They only have some teeth on their upper jaw, and they use it to hold on to their food and swallow it whole. We just learned about the Ulnar Collateral Ligament in the elbow. The two bones in the forearm are connected together by a few ligaments that hold on to them, like strings strapping the two bones together. The Proximal Radioulnar Articulation is by the elbow, and the Distal Radioulndar Articulation is by the wrist. We just learned about the Mexico state Sonora, where they do the Deer Dance. Another Mexico State is San Luis Potosí. It was named after Louis IX of France, and because they found gold and silver in this state they compared it to the mines in Potosi, Bolivia. The coat of arms of San Luis Potosí shows Louis IX of France on a mining hill, with gold and silver bars on either side for the mining in the area. The blue and yellow backgrounds are for night and day. There are many old gold and silver mines in the area that are not used anymore. There are some beautiful waterfalls and natural swimming places in the town of Tamasopo. In the Wirikuta mountains, the Huichol people celebrate their ancient traditions with art, song and food.